Update: this may be an iphone issue. It should override my volume regardless. Appx 2 nights ago, the alarm stopped working. It shows it’s going off but there’s no noise at all. The first night I thought I had forgotten to turn it on, but it just happened again. My volume is up (which never used to matter.). No idea what is wrong. 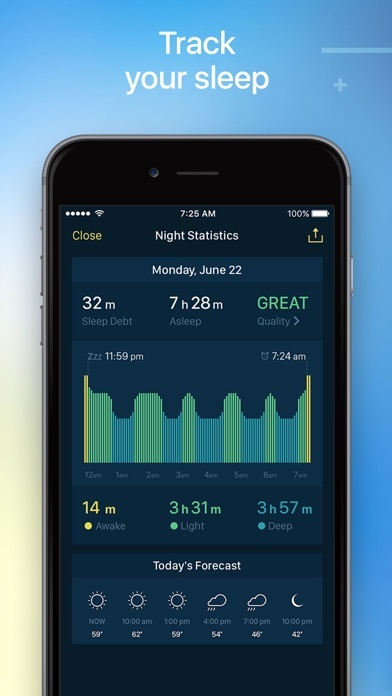 This is the best of the sleep tracker apps, better than Pillow and SleepScore. 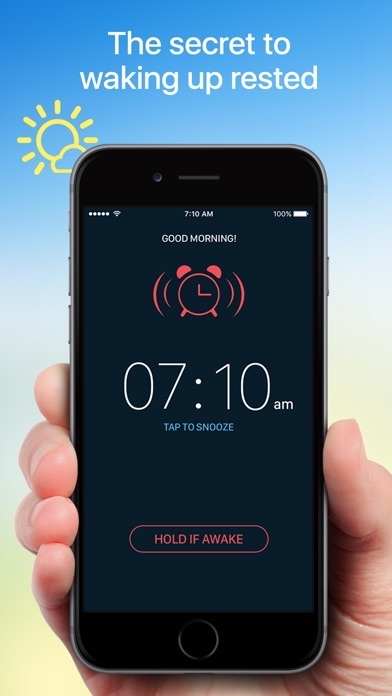 Would be perfect if you had the ability to change the alarm after it is initially set. I’ve been using this app for a little over a month now. The first couple weeks, it worked great! I could see my sleep patterns and how admittedly terrible they were, and it was good challenge for me to improve. My friend uses this app too, and it was fun to compare our stats. From the outset, I really liked the alarm options, from the different tones available to the variable wakeup window size. I like how in the stats I can see how my sleep was split between light/deep, when I woke up, the time spent in all 3, and the overall quality of my sleep based on those numbers and my set sleep goal. Unfortunately over the last two weeks there’s been dramatic decline in accuracy. I don’t know why, since I haven’t changed anything about my surroundings, but it no longer accurately tracks my sleep cycles. It tells l me I was awake for long periods when I know I wasn’t, deeply asleep when I know I was awake. The alarm clock still worked, but without accurate cycle readings, it’s not helping. Last night in particular was completely wrong, and it’s the last straw. It’s a beautiful app and I liked the features a lot, which is the only reason it gets 2 stars, because I’ll have to look elsewhere. Great to Track My Sleep! 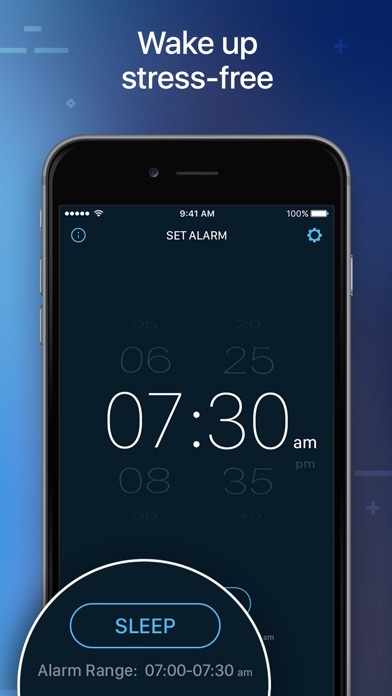 An easily understandable and very helpful sleep monitoring app. I’m sure it is adding years to my life while assisting me to take care of myself. VERY good app! GOOD sleep tracker! 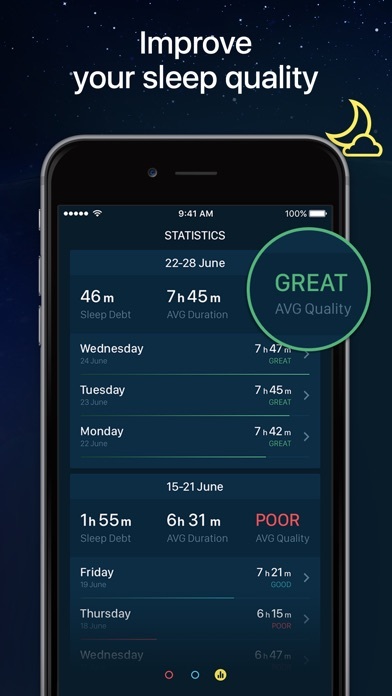 If you are looking for a good sleep-tracking app, I suggest that you try this one. For me, it has been great!!!! Waking up at the right time has made a HUGE difference for me! When I wake up at the right time, between sleep cycles, I am not groggy and sleepy all day. I looked through a lot of apps. This one is simple to use, is cost-effective, has a lot of choices to personalize it to you, and is reliable. >>>AND, you do NOT have to wear an Apple Watch to use it! 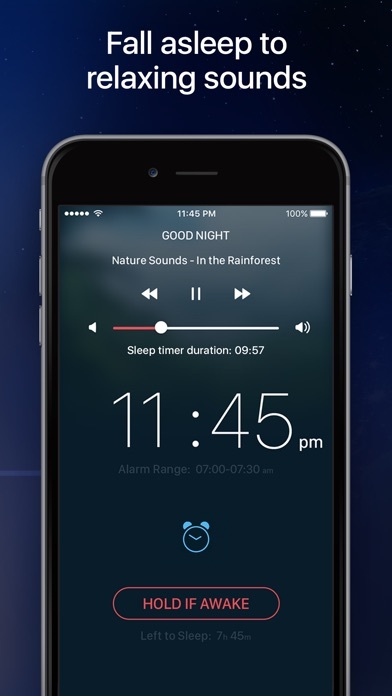 !<<< Since I charge up my Apple Watch at night, I cannot wear my watch for a sleep app!